It’s common in the wedding industry to refer to your wedding style as your “theme.” I was a victim of this when I started my business. When I set out to do a photo shoot, I felt like I had to come up with a theme first. But as I’ve grown, I’ve learned that having a theme ins’t necessary at all and I try to avoid using that term with my clients because themes are produced and unnatural. Having a theme implies that your using a common idea or something that has been done before. Instead, I urge my clients to look for ways to bring their personality and personal style into their wedding day, in ways that feel natural to them. If you set out to carefully and thoughtfully design your wedding from the beginning, it will come together without having to embrace a theme at all. This time of year is by far the most popular time to get married in the South, but just because you’re having a “fall wedding” doesn’t mean you have to make that your theme. There’s much more to autumn than pumpkins, acorns and apples. I am excited to be working on a few projects over the next month that will showcase ways to embrace a style that’s fitting for fall, without using a theme. Here’s an inspiration board I just put together for one of these upcoming projects. Great advice! I LOVE the inspiration board! It has such a moody, romantic feel. 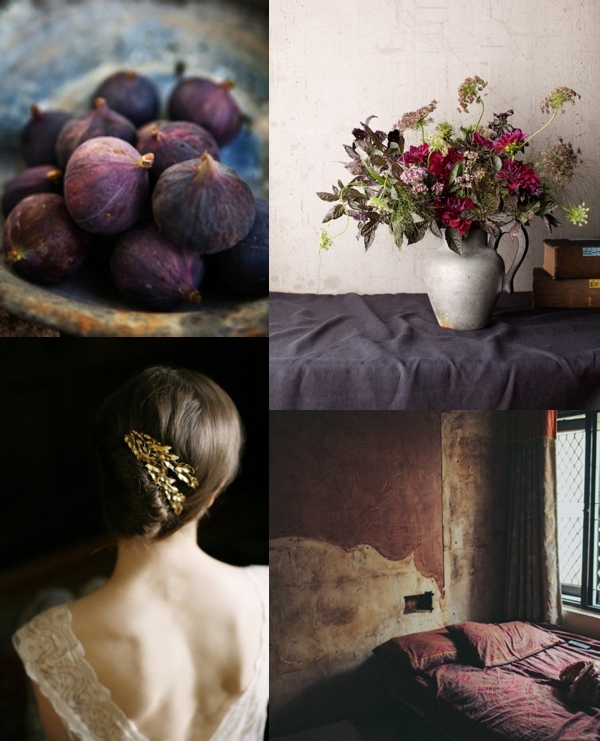 Adoring the deep fig purples and maroons with that nutmeg-y color . . .